Gourmet Kitchen in a Modular Home? Here's How! Gourmet Kitchen in a Modular Home? Here’s How! If your gourmet cooking style calls for lots of room and special, high end amenities, Palm Harbor has the kitchen you are looking for! People often have misconceptions about kitchens in modular homes. They may think the kitchens will be small and not functional for high-end cooking. 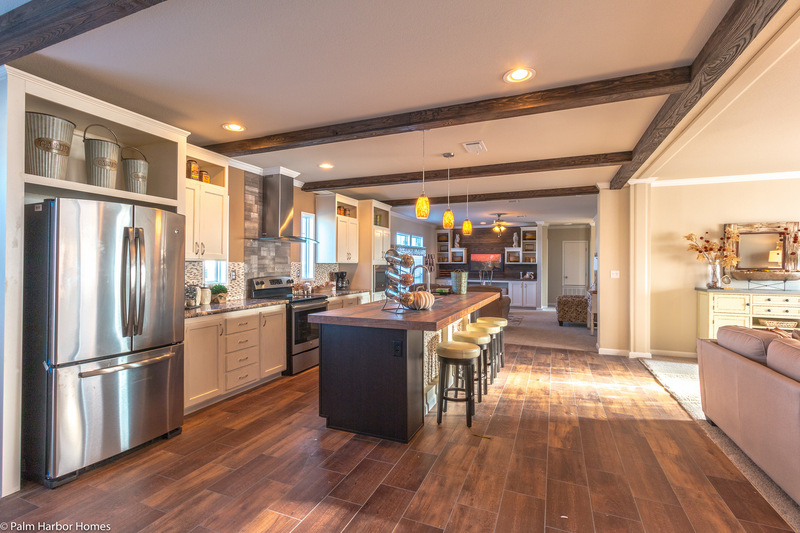 But one look at Palm Harbor Homes’ kitchen floor plans and you will be smitten! Not only are our kitchens incredibly spacious and designed with you in mind, but you also have the option to completely customize with quality products so your kitchen is exactly the way you want it. Here are just a few ways you can turn a typical cooking area into a gourmet kitchen with Palm Harbor Homes! Palm Harbor Homes installs only quality components into all our kitchens. Our craftsman studied the techniques of professional cabinetmakers to create a premium product. We invested millions into precision woodworking equipment so we can get your cabinetry just right. Our DuraBuilt cabinets are machined for ultimate strength and are available in a wide range of colors and styles. If door over drawer placement is important to you, be sure to ask about our options. DuraBuilt cabinets are built to last and are only available in Palm Harbor modular homes. Ceramic tile is the most durable and attractive surface available to homeowners. It is easy to clean up and able to withstand high heat, humidity, and frequent use without issue. This allows us to use ceramic tile for multiple uses throughout your modular home. Ceramic tile comes in many colors, textures, and styles to match your preferred kitchen aesthetic. It takes a special touch to be able to properly install ceramic tile. Our contractors have the experience, skill, and tools necessary to install ceramic tile with ultimate precision. We also offer other popular items like pull out faucets, farm sinks and granite island tops. After you move into your modular home, you can create small details that will really bring your kitchen up a notch. Purchase see-through storage bins to keep fresh ingredients in an airtight container. This will allow you to know exactly where everything is quickly! Add an herb garden on your windowsill that doubles as natural décor along with a never-ending supply of flavorful herbs and spices. Organize your pantry by including dates of when each item was opened and by frequency of use. You will always know exactly what is past its expiration date. If you are interested in seeing a modular home in your area, call Palm Harbor Homes today. Call 1-888-466-3718 to speak to one of our team members. The opinions expressed by the article do not necessarily reflect the opinions of Palm Harbor Homes. Thanksgiving in Your Modular Home: 3 Ways to Celebrate!